CarGurus has 6,737 nationwide Sierra 3500HD listings starting at $8,995. Is there such a thing as too much truck? Apparently not, as the 2008 GMC Sierra 3500HD serves up one-ton weight with 13,000 pounds of towing power. After a major overhaul last year, the 2008 Sierra 3500HD returns with standard XM satellite radio and a power driver's seat in all Regular cabs, as well as more color choices. The heavy-duty pickup comes in three trims. The Work Truck lacks air conditioning, but comes with a CD player, ABS brakes, dual front airbags, OnStar, and a Pure Pickup interior that includes larger handles and dials (easier to grab if you're wearing gloves) and more storage compartments. The SLE adds power features, and the SLT comes with the Luxury interior that includes leather seats, wood trim, and a 6-CD changer. All trims are available in either rear-wheel or all-wheel drive with low-range gearing. 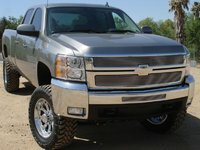 The standard engine is a Duramax 6.0-liter, 353-hp V8 with 373 ft-lbs of torque. The same engine in the SLT gets 312 hp. Also available is a 6.6-liter, 365-hp turbo V8 that achieves an impressive 660 ft-lbs of torque. All are paired with a 6-speed Allison automatic. This truck was built for utility, and its powertrain and precise handling earn rave reviews. 17-inch wheels are standard, and the 2008 Sierra 3500HD offers optional dual rear wheels. There are three cab types, all offered with either a 6.6- or 8-foot cargo bed. The two-door Regular seats two or three in one row. The Extended and Crew seat six in two rows, arranged stadium-style for better visibility. An optional power rear window is offered on these models. In the Crew, the rear seats also split-fold. Extended models have reverse-hinged doors that open nearly 180 degrees, while Crew Cabs feature regular-sized doors. Depending on your purpose, you can either lux up this truck with a navigation system, sunroof, and remote start, or outfit it for more rugged uses with the optional Z71 off-road suspension. This package also comes with stronger shocks and skid plates. 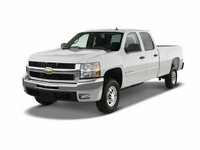 Power, towing performance, and the revamped stylish interior are the highlights for owners of the 2008 Sierra 3500HD. The lack of standard stability control or side curtain airbags (available as an option) are noticeable absences. 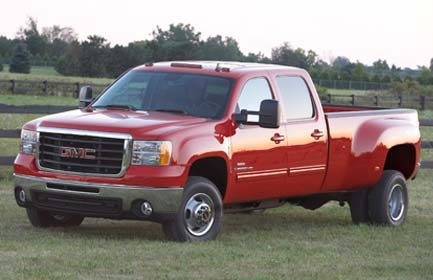 What's your take on the 2008 GMC Sierra 3500HD? 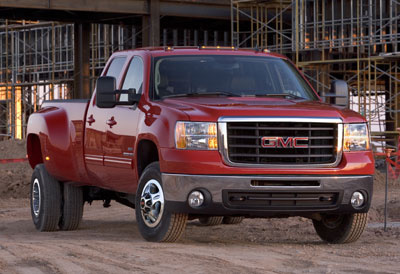 Users ranked 2008 GMC Sierra 3500HD against other cars which they drove/owned. Each ranking was based on 9 categories. Here is the summary of top rankings. Have you driven a 2008 GMC Sierra 3500HD? 08 GMC 3500HD Low Oil Pressure Alarm.